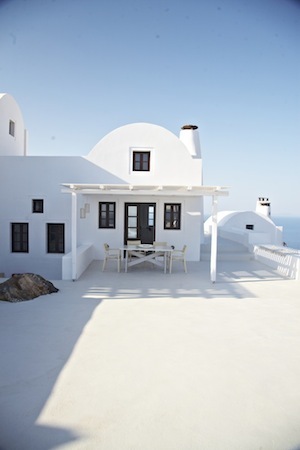 Aenaon Villas, Santorini. Travel Review. Where: On the highest and narrowest part of Santorini – you can watch the sun rise and set from the terraces and you have an uninterrupted view of the Caldera. When: I went in late July – it was hot, so you could easily get away with May or early October and still be out sunbathing. Great for a late holiday – flights are direct so you could even do a long weekend! How: I flew with Thomas Cook, it was £366 for two flights with extra luggage both ways and extra legroom seats. (So much legroom that I managed to sleep the whole way there!) Local taxi transfer is around €20. Who: Mr AMR accompanied me, of course. How do you think I got these lovely photos?! 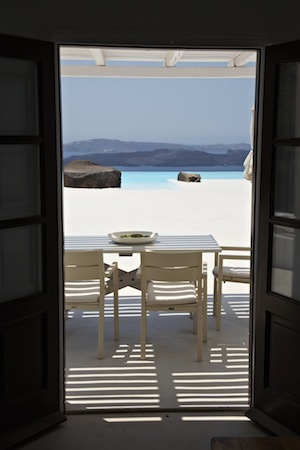 This is the ideal place for a couple – remote, private, peaceful and with a view to die for. There’s a no children policy – firstly because it’s a romantic and quiet place and secondly because it’s set on very, very steep cliffs. Leave the kids with the in-laws and settle in for a week of bliss! 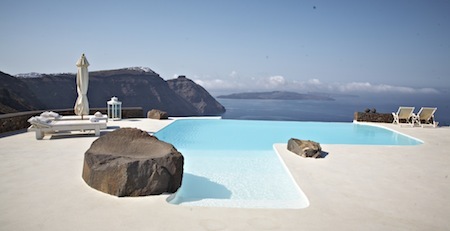 Why: Because you’ll be hard pushed to get a self-contained villa on Santorini that meets these standards, has such a stunning pool and location and has the benefit of being serviced. Villas are cleaned daily and breakfast is served at your own table in the privacy of your villa (or outside it, if you prefer). Take a little look at my video, below – I’ve tried to do a 360° view of everything for you because that’s the kind of thing I’d love if I was about to book a luxury break! Next Post My Favourite Autumn Dress!